Part of the sewing experience is there are times when I have to sit and pin or sit and hand sew. In those times, I like to pop in a movie or have the TV on to be glanced at. I consider my crafting ancestors and realize this is an anomaly. They would not have had TV, radio, DvDs or Blu-Ray movies to occupy their time when they were darning socks or stitching up a dress or two. Yet there is something about that "background noise" which makes projects go a bit faster than a house with no artificial sounds. As I was pinning sleeves onto the latest shirt to be completed, I popped in the quintessential Halloween movie. You'll recognize it. That's right, it's "Nightmare Before Christmas". This is my second favorite line in the movie. 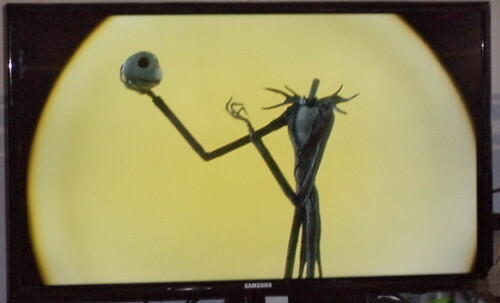 "And since I am dead, I can take off my head and recite Shakespearean quotations." I have to chuckle at this since a great number of ghosts permeate Shakespeare's plays and deliver important lines to further on the plot. My absolute favorite lines are spoken by this character at this time in the movie. 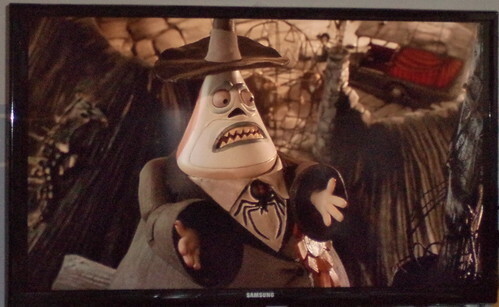 If you don't know the movie, the mayor shows up at Jack Skellington's house to go over the plans for next Halloween. Jack, having a crisis of identity, is out wandering about and is not home. After ringing the bell twice, the mayor goes from happy to this pleading face. "Jack, I'm only an elected official. I can't make decision by myself." When I see the current crop of presidential candidates, of either party, trot themselves out and start brandishing whatever policy they think can get them elected, I think of this character and simply laugh. The only other thing I need to watch is "It's the Great Pumpkin, Charlie Brown" and Halloween will be in full force. Time to change the fall wreath on the door to the one with ghosts on it.